Owner: Arya Transport Corp, Liberia. Flag: Liberia. Built: 1953 by Lübecker Flender-Werke AG, Lübeck, West Germany. Yard no 437. Machinery: 5-cylinder, 2-stroke Waggon & Maschinenbau-Krupp 5Z125 of 2,750 bhp at 115 rpm. Speed: 12.5 knots. Built as DAMASKUS for Hammaburg Reederei GmbH (Bock, Goddefroy & Co, managers) in Deutsche Levant Linie service. 1958-renamed LÜNEBURG, managers Hamburg-Amerika Linie. 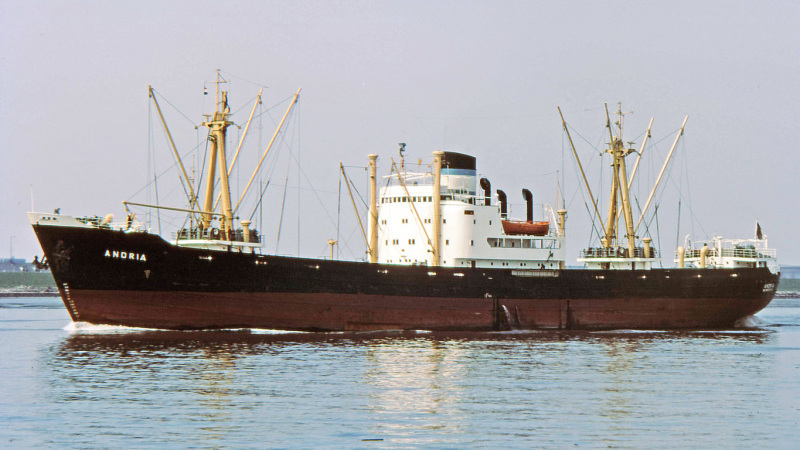 1964-sold to Belfranline SA, Antwerp, managers E Sasse, renamed CARIBIA (Belgian flag). 1967-ANDRIA (as photo); 1974-LAURA B (Cyprus flag); 1975-JEDDA (Cyprus flag); 1975-KYRA STATHOU (Panama Flag). 1979-grounded at Sila, Turkey, refloated 1980, sold and repaired; 1981-SADAN (Turkish flag). 1989-to breakers at Aliaga, Turkey 10/8. This photo has been shown 623 times since it was added to the site.